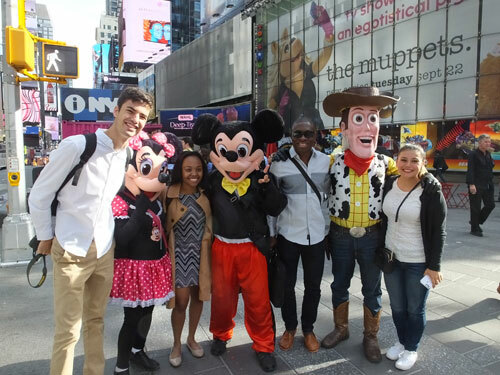 Travelling to New York for the first time to attend the Clinton Global Initiative (CGI) was an exhilarating and nerve-wracking experience for INTI student Nelson David Bassey. It also turned out to be a powerful life-changing experience for the third year Mechanical Engineering student who hails from Nigeria. Nelson was one of the three Laureate broadcast anchors selected from across the network to interview world leaders, philanthropists and other noted attendees who attended the CGI. He handled his duties with great aplomb and confidence and interviewed renowned personalities including civil rights activist Reverend Jesse Jackson, Chelsea Clinton and former Australian Premier Julia Gillard. He also cites the opportunity to meet and interact with his peers from across the network as a highlight of the event. “Having attended the CGI and meeting all these great people who are truly passionate and committed to social and community welfare issues, I feel like there is so much I can and need to do to make a positive and meaningful impact on society. Participating in the CGI has awakened a passion in me to make a difference in a way that is tangible and measurable,” enthused Nelson, who has also organised leadership workshops for the youth in Malaysia and the region in the past. Returning to Malaysia with renewed zeal and determination to drive change, Nelson aims to prioritize his time and focus on his not-for-profit organization which he and his friend, Stella Mutale Sata, established in Zambia that seeks to help strengthen access to education, address the problem of illiteracy and encourage youth leadership development in rural communities. Collaborating with local communities and NGOs in Zambia, Nelson hopes to equip local libraries with books, computers and explore the possibility of expanding access to education in rural areas through innovative platforms. “I am truly grateful to INTI and to Laureate for making this opportunity available to students like me who have traveled far in pursuit of a world-class qualification. It has been a truly life-changing and enriching experience for me,” he said. The Clinton Global Initiative was established by President Bill Clinton, 42nd president of the United States and honorary chancellor of Laureate International Universities, the world’s leading network of higher education institutions. CGI is a forum for government, business and philanthropic leaders to discuss solutions to the world’s biggest challenges. Through the Laureate International Universities network, INTI students, like Nelson, are given the exclusive opportunity to audition and be selected to participate in these international events which are attended by globally renowned philanthropist, public figures, business moguls, and social activists. INTI students have successfully represented the institution in the past at events like the Clinton Global Initiative and Nelson now joins ranks with his fellow peers who have created good impressions at such prestigious events.